Getting poor video playback or video problems using Linux Mint 18 or Ubuntu 16.04 and the open source AMD Radeon driver? Now add LIBVA_DRIVER_NAME=vdpau to /etc/environment and reoot. This has took me a little while to get working due to missing fonts etc and Steam and Creativerse not agreeing about them. Already installed under Wine but text/fonts missing from buttons and other areas in Creativerse using Wine on Linux? No problem. While there is no official Linux support for Creativerse as yet, it does work well under Wine. So here goes. install wine-staging, Instructions for various distros here. You could use the Wine supplied by your distro but for better performance I am using wine-staging. install steam using the official windows installer from the Steam website. change the path on the first line to match where your Wine install of steam is. 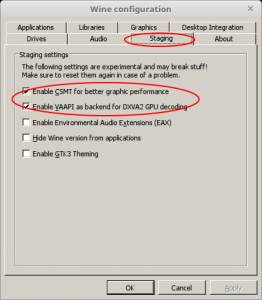 For better performance go to the staging tab in winecfg and enable the first two options. Creativerse occasionally bugs out during the initial loading screen. Just fire it up again and all good. 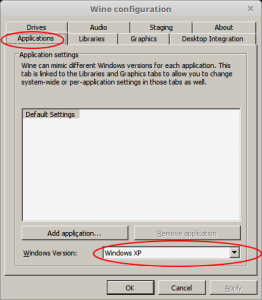 The windows version must be Windows XP for now or Steam wont run. Don’t forget the corefonts as you won’t get any text on the buttons and messages etc in game. The -no-cef-sandbox option prevents Steam crashing out due to a Chrome problem. The -no-dwrite option is needed as without it you will get no text in Steam after installing corefonts. As you might notice I am using a 64 bit Wine prefix. It works fine in a 32 bit prefix, some might suggest faster and more reliably. Just change the path in the Steam run commands to suit. I don’t really see much difference during testing so rather than messing about with prefixes etc, I stick with the defaults for my OS as long as it works and is playable. As usual, please use comments and I will try to answer any problems, also any useful hints ‘n tips you send in comments I will add/update this post with full credits. 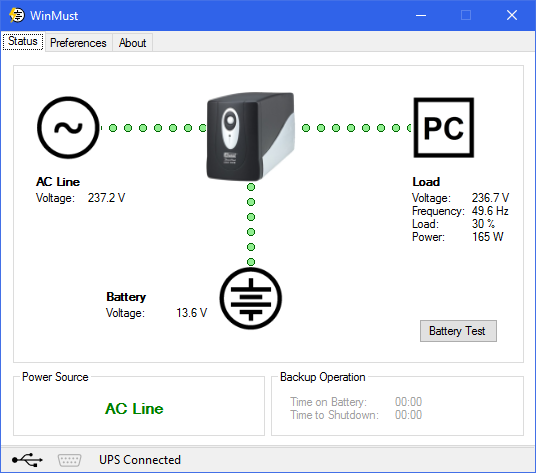 If you are stuck for decent free UPS monitor and graceful shutdown software for Windows 10, or a bit put out by the lack of software or enormous Java apps provided by many UPS manufacturers, you can’t do much better than these two apps. 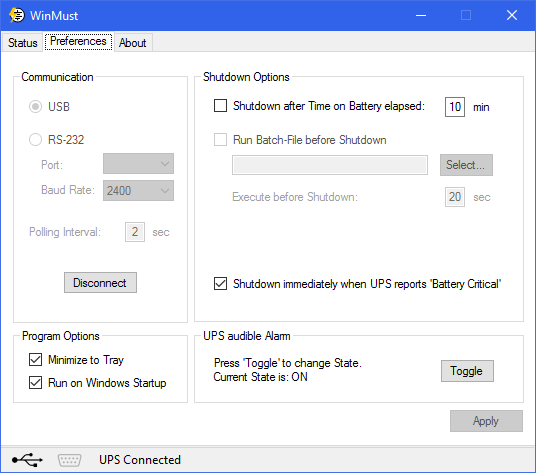 It does depend on your UPS as to whether these apps will work for you, but they are very small and work fine on my SYNDOME/Mustek Cypress semiconductor USB-Serial UPS running on Windows 10 64 bit. Tiny download but nice status display and has shut down options. Very simple program with tiny memory footprint and minimal performance impact. Another tiny download. 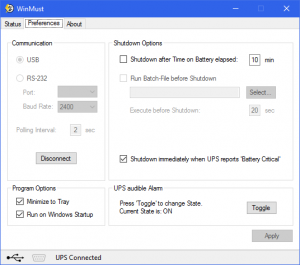 Does not look as nice but has SMTP/HTTP and LAN network message notifications as well as shutdown options. All the usual information is there. An obvious choice if power event notifications are what your looking for. 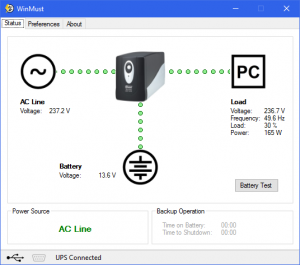 Let me know in the comments if you found any other small free UPS monitoring software and I’ll add them to the list. 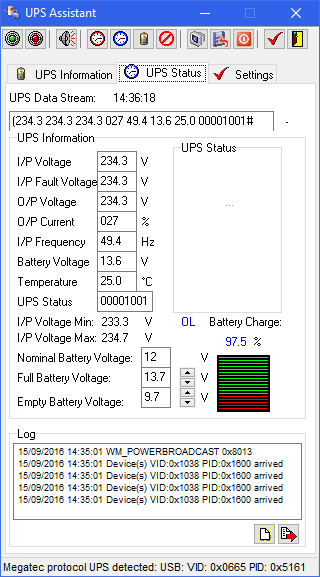 Also let me know what other makes/models of UPS these programs work on for you.